The 173rd OPEC Meeting and 3rd non-OPEC Ministerial Meeting concluded with an agreement to extend the production cuts all the way through 2018. Saudi minister Khalid Al-Falih also implied that production in 2018 by Nigeria and Libya would not increase, based on information from those countries. In 2017, large increases by the pair undermined cuts made by others. 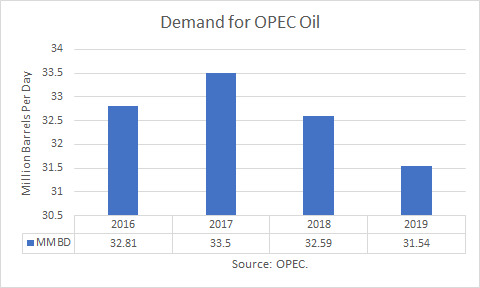 "In view of the uncertainties associated mainly with supply and, to some extent, demand growth it is intended that in June 2018, the opportunity of further adjustment actions will be considered based on prevailing market conditions and the progress achieved towards re-balancing of the oil market at that time." "To support the extension of the mandate of the Joint Ministerial Monitoring Committee (JMMC) composed of Algeria, Kuwait, Venezuela, Saudi Arabia and two participating non-OPEC countries of the Russian Federation and Oman, chaired by Saudi Arabia, co-chaired by the Russian Federation, and assisted by the Joint Technical Committee at the OPEC Secretariat, to closely review the status of and conformity with the Declaration of Cooperation and report to the OPEC – non OPEC Conference." Initially, at the meeting a year ago, the oil ministers predicted that the glut would disappear within six months. Then at the May meeting, the Saudi minister predicted that the extension would "do the trick" of draining the glut "within six months."